BEIJING - It is common nowadays to see people using ZTE-produced mobile phones in Indonesia, in sharp contrast to 10 years ago, said Fan Xiaoyong, managing director of PT ZTE Indonesia. With more Indonesians buying mobile phones, companies such as ZTE Corporation are designing and installing mobile applications that signal the times for daily Islamic prayers in the country, home to the most Muslims in the world. Even though companies such as ZTE Corp - China's second-largest telecom equipment maker - began trying to enter the Indonesian market starting in 1999, they encountered many obstacles. The situation has changed greatly in the past decade. ZTE's business in Indonesia has been gaining momentum since 2006, when it achieved annual sales of $200 million. Its revenue has since doubled. "ZTE continues to grow fast here. Our telecom equipment business is robust. What's more, we have enjoyed an unexpected, high growth rate in mobile device" sales, including mobile phones and data cards, Fan said. The breakthrough in Indonesia came largely after China's entry into the World Trade Organization (WTO), said Tina Tian, a telecom analyst with Gartner Inc.
Tian added that ZTE benefited from China's entry because, afterward, there were fewer barriers to competition in a much freer and fairer overseas environment. "If China was not a WTO member and was still afraid of opening its own market, how could Chinese telecom gear makers have the chance to sell their products in overseas markets?" Tian asked. According to Tian, the decade after the WTO entry was a "golden era of overseas expansion" for Chinese telecom equipment producers. Huawei Technologies Co Ltd, the larger Chinese telecom equipment giant and rival to ZTE, seemed to gain even greater popularity worldwide during the period. "Both Huawei and ZTE were founded in the late 1980s, but they remained tiny through the late 1990s. In the interim, foreign vendors were the incumbents," said C.W. Cheung, Asia-Pacific consulting director of technology at the research firm Ovum PLC. Cheung said that during the past 10 years, Chinese vendors became dominant in many sectors domestically, and, for Huawei, ZTE and others, increasingly internationally as well. Established in China's southern coastal city of Shenzhen in 1987, Huawei has become the world's second-largest telecom-hardware maker, competing with the likes of Sweden's Telefon AB LM Ericsson and Paris-based Alcatel-Lucent. Huawei realized annual sales of 185.2 billion yuan ($28.35 billion) in 2010, not far behind the leader, Ericsson, which had $30 billion in sales. The Chinese company is expected to overtake its Swedish competitor this year. Overseas markets, including Europe and the United States, have generated more revenue than the domestic Chinese market for Huawei since 2005. Huawei's revenue from overseas markets reached 120.4 billion yuan in 2010, up 33.8 percent year-on-year. Overseas sales in 2000 only reached $100 million. "Branding is not as important for telecom equipment makers as for consumer goods makers. Advanced technology and quality products are what really matter," said Xiang Ligang, a Beijing-based telecom expert who also runs a Chinese telecom industry Internet portal. 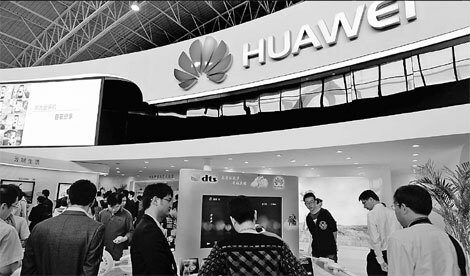 China's entry into the WTO accelerated Huawei's and ZTE's global expansion, as both companies learned to play within international rules and make use of favorable policies, Xiang added. Cheung noted that Huawei and ZTE had achieved their current positions through hard work, creativity and government support. "Persistent global financial instability and difficulties in the past three years also helped differentiate the low-price, high-performance-value propositions of the Chinese vendors," he said. However, Chinese telecom gear producers had some problems during their aggressive expansions. Huawei encountered hurdles in India and in the North American market because of political concerns, as local governments contended that the company founder, Ren Zhengfei, "had a Chinese military background". Ericsson filed lawsuits against ZTE in three European countries in April, charging that the Chinese company had breached its patents related to the second- and third-generation wireless technologies known as GSM and WCDMA. "Recent setbacks for Chinese telecom vendors taught them a lesson: Business is not all about offering better services or products, and selling at a lower price. Business is sophisticated. "Therefore, they should adopt appropriate strategies for some mature markets," said Ji Chengdong, an analyst with the research firm Frost & Sullivan. Huawei is trying various tactics to become fully involved in the global market. The company has been appointing more foreigners in recent years. The company's latest such hire was John Suffolk, a former British government information official, to the position of global cyber-security officer. Huawei and ZTE have made good progress in selling mobile devices to US carriers, a sign that they are finding other ways to break into the US market. "If they are able to break into the US market, they are even more likely to break into the top tier of mobile device vendors, which has so far been dominated by companies from the US, Europe and South Korea," said Jan Dawson, chief telecom analyst with Ovum.